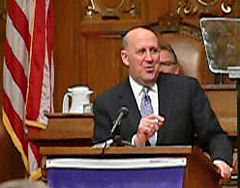 You are here: Home / Budget / Doyle: "staying even is the new increase"
Doyle: "staying even is the new increase"
Hours after the U.S. House of Representatives passed a federal stimulus package – minus the support of Wisconsin Republicans or any other GOP members – Governor Jim Doyle used his State of the State address to remind Wisconsin residents of the state&apos;s enormous fiscal challenges. "As hard as the federal government is working with us, this will be a time of sacrifice," Doyle told a joint session the state Senate and Assembly and other state officials at the Capitol Wednesday night. "None of what&apos;s ahead will be easy." Between his review of accomplishments, and his proposed policies and introduction of guests, Doyle got down to the stark reality of Wisconsin&apos;s $5.4 billion deficit – and what it might mean for state government in his forthcoming budget. "Staying even is the new increase," Doyle said "And for everyone who&apos;s looking for the state budget and wondering what may happen, please remember that&apos;s my mantra: staying even is the new increase." Still Doyle said his priorities are clear: to safeguard education, health care and local services in Wisconsin communities, especially where the state&apos;s most vulnerable residents are concerned. "A second grader is not going to be able to come back when the economy is better, and pick up where she left off, if we fail her today," said Doyle. "An older person cannot check out of a nursing home and come back in a few years, when the economy is better." Doyle also pitched familiar policy themes, including insurance coverage for families of autistic children. "We can make sure kids with autism can get the coverage they need," he said. "Private insurers should cover autism. The treatment has been proven effective, and families deserve the right to see their children improve." A statewide smoking ban also remains on the governor&apos;s policy wish list. "We can make sure all our public places are smoke free. Twenty-four other states other states have done it, dozens of our communities have done it. Let&apos;s not be dragged kicking and screaming as the 48th or 49th state to do it." Doyle also said it&apos;s time to combat drunk driving in Wisconsin, by allowing "controlled, reasonable sobriety checkpoints," and by passing legislation that will make the third OWI offense a felony. On K-12 education, Doyle said the state "can change school funding in a way that encourages the hiring and retention of good teachers, provides for high standards and encourages efficiencies in our school districts," although he provided no insight as to what that funding change might look like. The State of the State address has traditionally been an occasion for the governor to recognize the accomplishments of specific residents, and this year&apos;s was no exception, as Doyle introduced Janesville General Motors plant workers Lenette Holden, Jim Koeberl, Todd Brien and Leo Carillo, Will Allen, the CEO of Milwaukee&apos;s Growing Power and a McCarthur Foundation Genius Grant winner, entrepreneur Joe Van Groll, who&apos;s used leftovers from the cheesemaking process to create ethanol, Wisconsin National Guard members Ron Adams, Allen Robertson and Jarret Nelson, and Jeffrey Skiles, the copilot of the U.S. Airways jet that ditched in the Hudson River two weeks ago.